Two of the aesthetics I’m really into right now are 90’s space punk and 60’s prep. Those two looks seem soooooo different to me. How on earth would anyone ever rectify prim shift dresses with holographic vinyl? 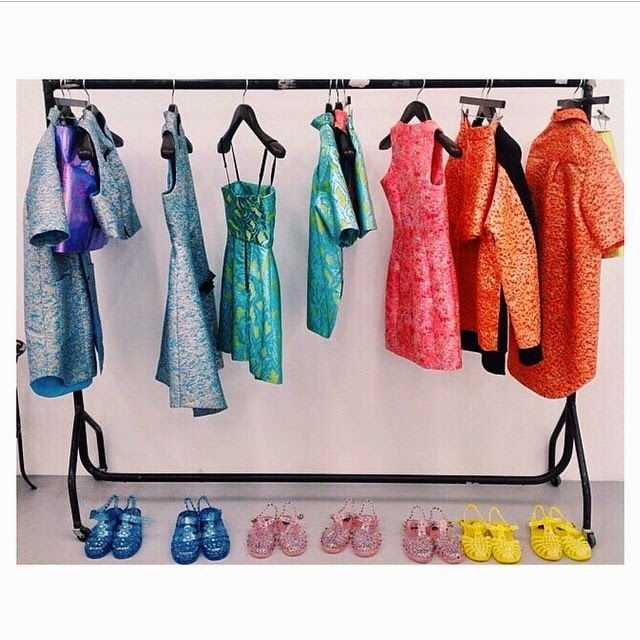 Then Markus Lupfer’s spring/summer 15 line came along. I love how he took this 60’s sofa fabric and put it in these sporty silhouettes paired back to JELLIES. You really have to look at the collection in order because we have all these ladylike fabrics and then BAM – pop of holographic! From then on it’s full-on 90’s space punk. We partying like it’s 1999 here. And these purple pieces are SO KILLER. I think I might really need to buy that jacket. I also found out that Markus Lupfer is also going to be selling the footwear. Would you buy those jellies? I still have vivid childhood memories of jelly-induced blisters, but they are quite cute.